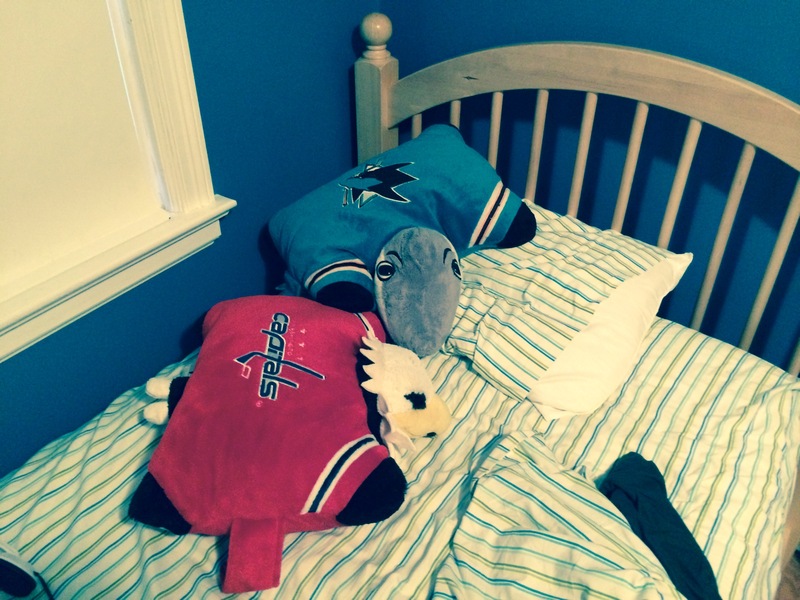 A rare Caps-Sharks game is an event in our house. Ryan is going through a rough stretch with one school subject, which has ramped up his anxiety to a very high level. Homework and study sessions have become an exercise in frustration. Ryan becomes a hive of frenetic activity, focused solely on trying to finish the work as quickly as possible. The problem with that is he doesn’t stop long enough to listen to suggestions or check his work. His efforts are done in by basic mistakes that could be avoided if he could only slow down long enough to notice. This, of course, leads to more frustration and anxiety, as Veronica and I sit patiently by and try to assist him fall victim to the same cycle. It hasn’t been pretty. But that’s a story for another post, one I don’t want to write until we’re back on an upward trajectory. Instead, I want to focus on the best part of my day yesterday. As is often the case, hockey was involved. 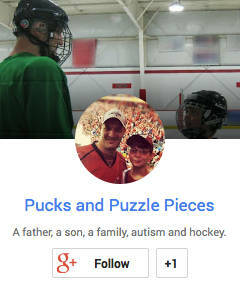 Ryan has ice hockey practice on Tuesday nights. The schedule is not easy on him, as we don’t get home until almost 10 p.m. It’s especially hard if he has an after-school activity or stays late for extra help. Add in that homework was taking far longer than usual yesterday due to the circumstance described above AND that his San Jose Sharks were playing my Washington Capitals at 7 p.m. (a start time that allows him to stay up to watch) and it was no surprise that Ryan was hemming and hawing about going to practice, starting a day or two earlier. The plan was for him to text me after he got home from school and let me know how his homework was going. All I could get out of him was “don’t know yet.” Veronica let me know that it wasn’t going well. It was less than 30 minutes until we had to leave for practice and he still hadn’t made up his mind. I did not want him to skip practice. He needs to understand that being on a team means honoring your commitment to your teammates and coaches. But if it became obvious that going to practice would add to his anxiety, we both knew that the right decision was to let him stay home. I just didn’t want the decision to be about watching the Sharks game. When I got home, the homework storm was passing. I told Ryan he had to make up his mind about practice. It didn’t appear that attending would make his anxiety any worse, so I felt good about leaving the decision up to him. We praised him for the decision and suggested that it might even help him burn off some of the frustration that came from his homework experience. Ryan had one condition. He wanted to watch the Sharks-Caps game in the car on the way to and from the rink. Thanks to the miracles of modern technology, he was able to do so using my iPhone and the NHL’s GameCenter Live app. He settled in the passenger seat with my phone and put his headphones on. I reminded him that I was also interested in the game and asked if he would take the headphones off so I could hear the game while I drove. I playfully teased him about the contest, complaining about every call that went against Washington. Ryan gave that back, and more, when San Jose scored first. We pulled into the rink just as the first period ended. Ryan had a good practice, giving his all in the drills and appearing to interact with his teammates. After he changed he came running out of the locker room, demanding to know the score. I told him it was 1-1 in the third period. He asked for my phone. He watched and I listened as the game went to overtime on our drive home. We were pulling on to our street as it was headed to a shootout. I told him if we ran inside we could catch the shootout on TV. He said no, he wanted to stay in the car and watch on the phone. I knew Veronica would find it odd if we stayed parked in the driveway for a few minutes after arriving home, so I pulled over and put the car in park a few hundred yards from our house. I held the phone between us and leaned in close to him to watch the shootout together. Ryan teased me after every Washington miss and I did the same to him after San Jose players did the same. San Jose scored the only goal, and when the Sharks’ goalie made the final save to clinch the victory, Ryan had a grand time giving it to me. I laughed and smiled throughout. We sat together watching for no more than three or four minutes, but they were the best three or four minutes of my day. I thought of how, after I moved to New Jersey as a kid, I used to turn my clock radio on its side to pull in the Capitals’ station at night and listen to games. Occasionally my dad would come in my room and we’d catch the end of one together, shaking our heads if Washington lost. Times have changed. Technology sure has. But the bonding power of a shared love of a sporting event with an uncertain outcome is the same as it has been for generations. I was only too glad to share that bond with my son at the end of a trying day, watching live on a five-inch screen, parked up the street from my house — but completely at home.